When it comes to permanency, ink drawing tops the list. 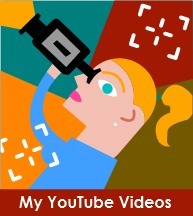 There really isn’t much room for error, although there are ways to fix things when necessary. So why do I keep on working with ink? I just love the look of finished ink pieces. But more importantly, I love the feel of a good, solid dip pen in my hand and the variety of marks different nibs make. 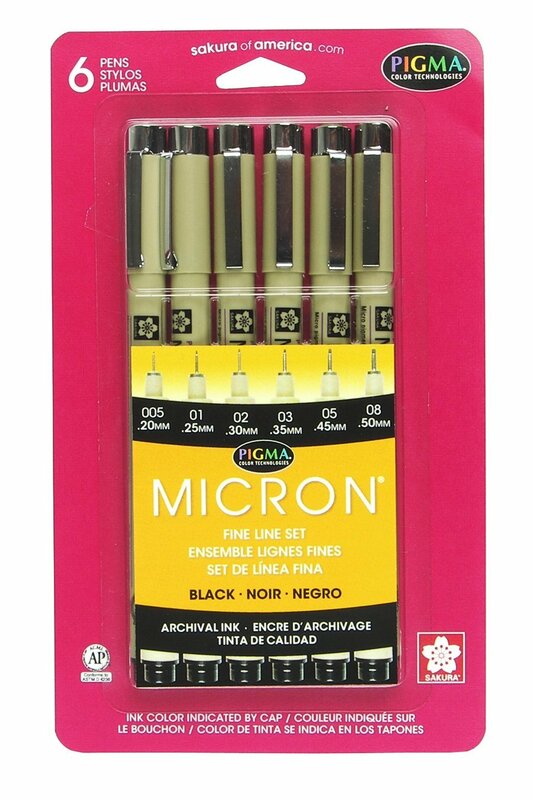 Of course, I still work with technical-like drawing pens, such as Micron, Copic and most recently Le Pen Drawing Pens. It’s a bit inconvenient to work with dip pens outside or when traveling, although I’ve been known to carry my small traveling ink bottle with me. Last issue I covered the dip pen at length. Now I’d like to discuss the drawing pen. Today there are so many different pens on the market; it’s a struggle to know which one is best. And all of them have different standards for their nibs. 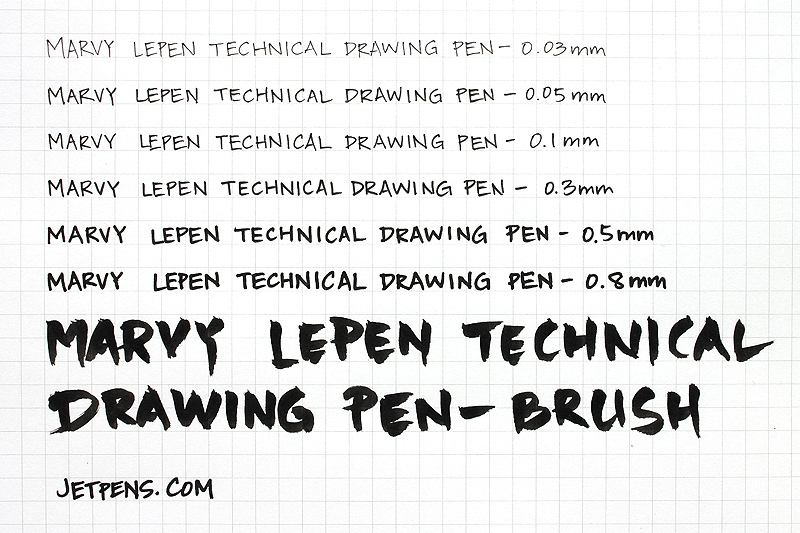 Below you can see a diagram of the different points sizes and their “weight” for the Rapidograph pen (one in which I will discuss in this article). Most drawing pens have numbers on the top side of the cap. The numbers represent the weight or width of the line created by that pen. Back in my advertising days (before the computer did all our work), artists used the Rapidograph pen by Koh-i-noor. They were not only extremely expensive but also a bit finicky, always seeming to clog up. In the past few years, the company has repackaged them (so to speak) and is now selling them as Rapidosketch, although you can still get the original pens. I have had my struggles with these pens, to say the least. Finally this summer I took my three pens (one Rapidograph and two Rapidosketch) and soaked them in Windex®. Amazingly, I was able to get them unclogged and effectively working. They are still going strong to this day. Who would have thought Windex would do the job. Pictured below, you can see my three pens. What’s nice about them is that you fill the ink cartridge and start inking. With others you have to buy a replacement cartridge or throw the pen away when dry. Below is an illustration of the pen’s parts from Koh-i-Noor. Be careful when cleaning these pens. It’s easy to lose a part down the drain. The process can be very, very messy. Expect to shell out some bucks on this pen. One Rapidograph pen goes for $25-$35 and the Rapidosketch costs around $18. I have to say that for years the Micron pen was my workhorse. The pen is reliable (hundreds of students have used them in my art kits), easy to use, with consistent ink flow and offers several nib sizes. They are a throw-away though. So when they are dry, they are worthless. The good news is it takes a long, long time to dry up. As I said, students in my classes and workshops have used these for several years and they are still kicking. 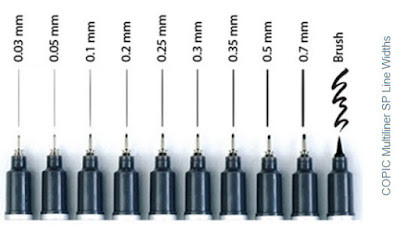 Here’s a photo of a Micron pen set with following nib sizes: 0.20mm, 0.25mm, 0.30mm, 0.35mm, 0.45mm and 0.50mm respectively. Depending on what I am drawing, I usually stay with the 0.35mm and 0.50mm. The best way to find out what you like, is to go to an art store that sells these pens separately and try them on a scrap of paper, if allowed. Obviously, the larger the number on the pen, the larger the line will be. I personally don’t like working with 07 or 08 nibs unless I am covering a large area, such as a background. 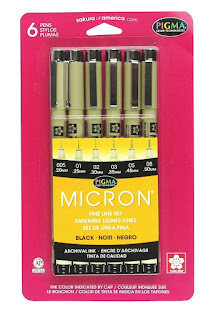 Most Micron pens sell for around $2.50 each. 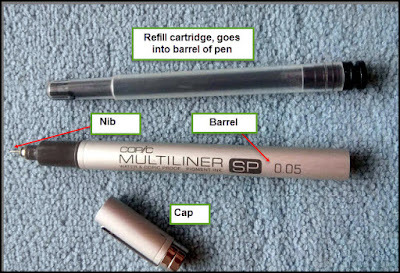 About four or five years ago I ran across the Copic Multiliner technical pen. It comes with a metal shell, replaceable nib and a cartridge. At times, I have really found these pens to be wonderful and then sometimes a bit frustrating. To keep the ink ready to flow (at least for me), I must store the Copic pens in my pen holder with the cap headed downwards. I used to just put them in my holder with the head facing upward. After all, the numbers are listed on the cap (also along the barrel), so it was easier for me to grab the right size that I needed. But after a while, the ink struggled to get flowing. One of the sales clerks where I purchased it (and a big fan of Copic) recommended the downward placement and it worked. 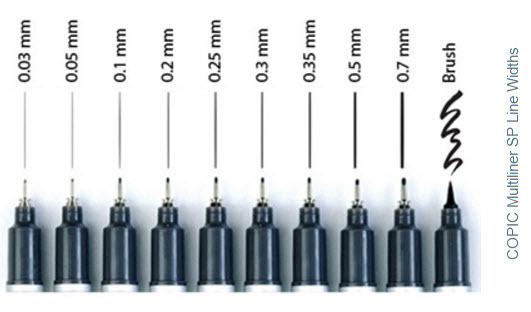 These pens also come in a variety of nib sizes as you can see from the chart listed below. Below, I’ve pulled apart a Copic pen so you can see its different parts. You can purchase the refills and nib replacements at some art stores and online. The pens cost around $10 with refills available for around $2.50. I have been using the Le Pen fine line markers for sometime, but not their technical pens. These came out a few years ago and I was drawn to them because they were only $1.59 each (online). Most of the other pens are $2.50 or more (way more for Rapidographs as we saw above). I have seen these pens at brick and mortar stores going for $1.99 to $2.50. It pays to check around. 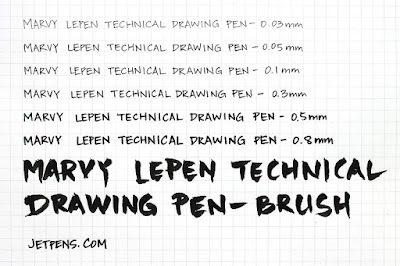 Below is a chart created by jetpens.com to illustrate pen width. Last but not least, we need to talk about paper. 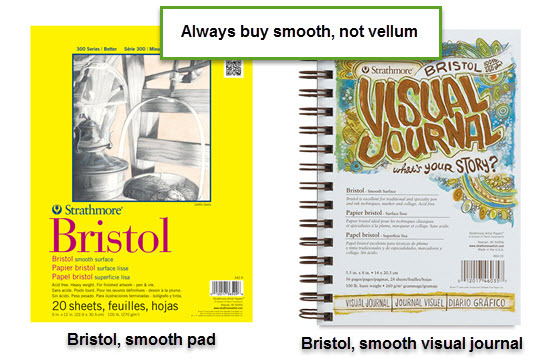 Generally I recommend Bristol paper that is smooth—a good, inexpensive choice is Strathmore. In the art shop you will see a few choices. 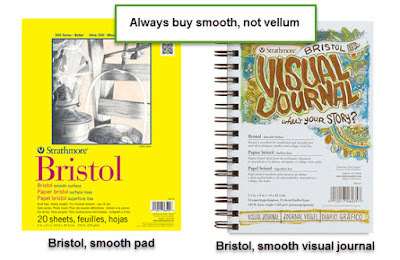 Please, please do not buy a vellum surface, which is bumpy. You want a smooth or what is also called a plate surface. I’ve used Strathmore for years and have found it to be very sturdy and heavy enough for wet media; that is, if you want to add some watercolor or colored ink to your project. But here’s a word of warning regarding watercolor— because the paper is made from wood pulp, the paint will not act the same as if it were on 100% cotton watercolor paper. It just takes some experimentation and practice. 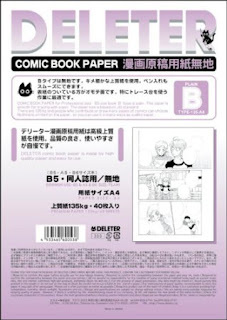 Another alternative, especially when you are first learning, is to purchase some laser paper at your stationery store. It’s smoother than a baby’s bottom and a great place to make lots of mistakes. Simply put, there’s nothing like placing your pen—dip or technical—on smooth paper and feel the gliding motion. Most comic and manga artists use either a Bristol paper or Deleter comic book paper, another good choice. I do not recommend highly fibrous paper, especially for dip pens. The technical drawing pens can tolerate watercolor paper much better. With textured paper, your nib can catch some of the fiber, which can even get stuck in between the tines. Not a pleasant experience. So there you have it. Hopefully I’ve given you some valuable information on what to purchase when diving into pen and ink. Next month, part three and the final in this series, I will talk about techniques. If you want to experience pen and ink first-hand, check out this Saturday’s workshop in my studio at http://www.jillgoodell.com/workshop.html.